I sure hope Spring is coming soon because snow in March is no fun! I can't wait to hear the birds chirping and the lawn guy mowing our grass (that means I don't have to do it!!) 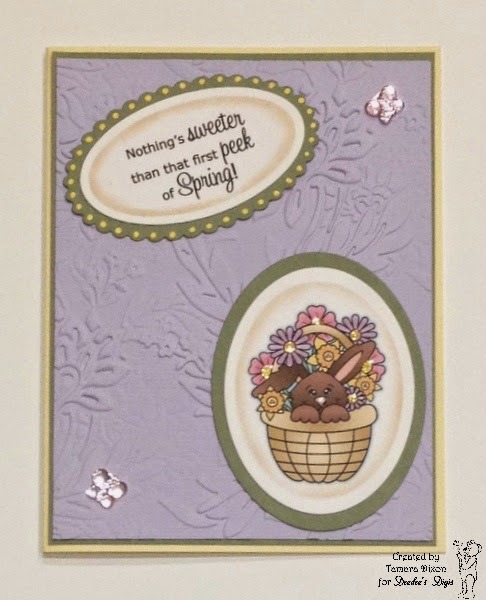 So I guess for now we will just craft "spring" projects with Allsorts Challenge Blog until the "real" Spring decides to arrive. Come play with us and get in the mood for Spring! Don't forget Deedee has just released some super cute new Spring digis! Click HERE for all the Spring Digis! Tamara used one of my favorite image for spring. I love the paper and embossing for the background. Thanks for sharing.